A telescoping broom pole. It comes with our Sweepa Rubber Broom, but it can also be used with other heads and tools. Made from steel, this commercial grade pole will hold up for many years, even with everyday use. It collapses down to 34" in length, and it's extendable up to 52". Simply twist either section to loosen or tighten, and set it to the perfect length for the user, or job being performed. Works with or rubber broom heads, but also compatible with other tools that have a standard thread. Order Yours Today! 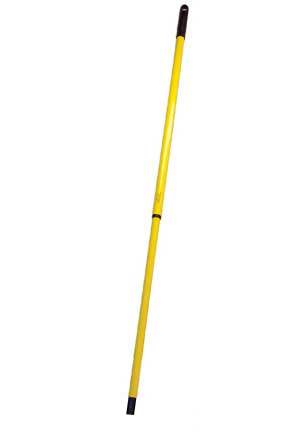 A sturdy broom pole that adjusts for length. This is truly a fantastic broom. Works well, holds its stiffness without damaging anything. Perfect for snow removal on cars even! I really loved those pole. Was my second time buying! I purchased the Sweepa rubber broom and needed to replace the65m handle. Customer service was wonderful and I received the new handle quickly and it fit perfectly. I recommend this company when you need to make a purchase,they really do have "good stuff". I just love my broom it picks up everything . We ordered these for sweeping hair at our salon. Great for getting up the hair, but the handles would last longer if they were solid wood. The metal around the joints is thin and we've had two peel and break already. They immediately shipped out new ones to replace them. we love the broom so happy we have the pole for it. it's nice as it get larger, but sometimes feels like it could break. hasn't yet. we would love to order another sweepa, just haven't yet. they didn't have it at state fair last year so was upset about that. Needed a new extension pole. Viola -- works great.